The cabin, built by Deleglise, serves as an excellent model of building typology in northern Wisconsin during the period of its settlement. The history surrounding the cabin's construction and evolution are similar to that of homesteads being built throughout the region at the time. The first log cabins in upper Wisconsin were stopping places along the Lake Superior Trail and Military Road. These log cabins played a very significant role in laying the foundation for the great progress made in opening up the Langlade County area and its resources. As settlers arrived, their first thoughts turned to providing shelter for themselves. Simple cabins, usually fourteen or sixteen feet in length were built using traditional construction techniques. The early homes of upper Wisconsin are basically similar: log structures with minimum openings, lean-to additions, and wood shake or scooped roofs. Francis Deleglise had the cabin built for his family in 1878. Originally one rectangular building, a small office of log construction and a lean-to clapboard and frame kitchen and bedroom were added soon afterwards. The cabin originally stood on the west bank of Spring Brook, near what later became north Superior Street (Highway 45). The Novotny Brothers saw mill opened in 1879, and with rough sawn lumber available, the scooped roof was removed, the walls raised several tiers, and a new gable roof was erected. The family hosted services by Father St. Louis, attended by the entire community. A few original artifacts in the cabin included furniture pieces, pictures, and Deleglise's tripod and surveying equipment. The Deleglise family built a second home in 1886 several blocks to the south and the cabin was used for other purposes. The cabin served for a time as the printing office for the New County Republican. The original cabin was vacant at the time it was moved to the library grounds to be refurbished. In 1914 the thirty-six year old cabin was standing in the way of development. Local officials, rather than tear down the building, arranged to have it moved to the north side of the city library, a Carnegie building and now a museum on the National Register of Historic Places. The Wisconsin Historical Society cites this as one of the first, if not the first, efforts in Wisconsin of a community preserving a log cabin and a part of its heritage. The office and kitchen additions to the cabin were not preserved in the move. The altar in the cabin, ca. 1874, is attributed to Reverend Philip St. Louis who conducted Antigo’s first mass. 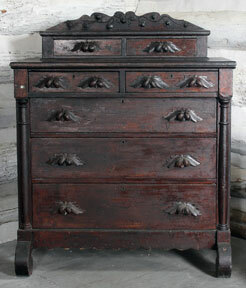 Chest of drawers attributed to Francois Bernard, Appleton, 1853-1865. In 1998 the city opened a new library and ownership of the Carnegie Library and cabin were transferred to the Langlade County Historical Society. At that time a major fundraiser was mounted to restore the cabin and reconstruct replicas of the office and kitchen additions. 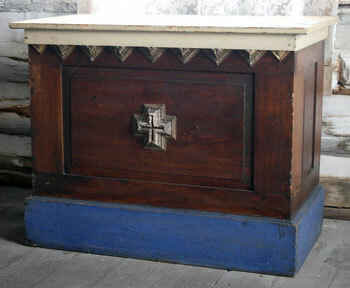 The restoration was done by Laib Restoration Inc. It involved disassembling the cabin, marking each log and reassembling it at a new location slightly closer to the road. Some logs were replaced by similar ones and of similar vintage since they were showing signs of decay. In 2007 the museum completed the restoration of a steam locomotive and "Railroad Park" situated on the north end of the building. The cabin was moved to the south side of the museum and raised onto cinder blocks so as to help preserve the bottom layer of logs. 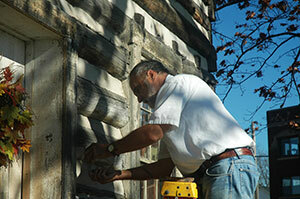 Terry Laib specializes in restoration of Wisconsin’s historic structures. Once again he visited Antigo from his home base in New Berlin.. On an unusually warm and pleasant fall day he repaired some of the chinking on the Deleglise cabin. 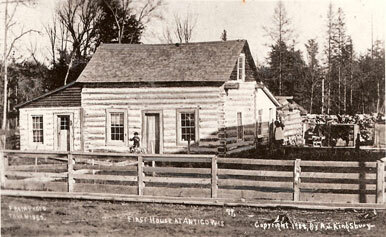 In 1914 city officials preserved Antigo’s first home by moving it south a few blocks on log rollers from its original location near Antigo Lake to the library/museum. The small addition which had been Deleglise’s office has been removed for the move and is indicated by the white wash at the left end of the cabin. Antigo may be the first city in Wisconsin to make an effort to preserve part of its history. In 1914, as the city grew and downtown buildings proliferated city officials decided to move the Deleglise cabin from its original location near Antigo Lake to what was then the library (now museum). Over 100 years later and after two further moves on the grounds of the library/museum and a major restoration in the 1990s, we still strive to preserve the cabin even as we raise funds to update the museum’s main floor ceiling and lighting. The rumble of traffic on Superior Street and the passing years have caused some deterioration to the chinking. As in the past we turned to Terry Laib for preservation expertise and assistance. Francis Deleglise’s original Antigo home, erected in 1877, is still in good hands and offers visitors a glimpse of pioneer life in Langlade County. The cabin is closed in winter and some cold sensitive artifacts are moved indoors.